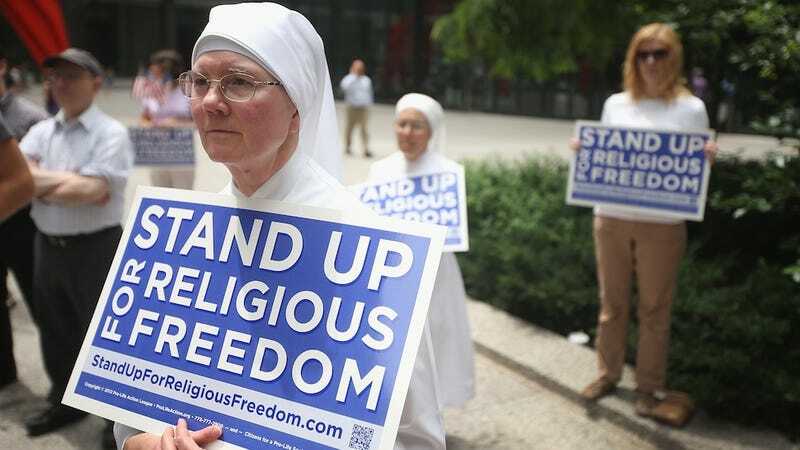 Yesterday, a five conservative Catholic dude majority (yes — Scalia, Roberts, Alito, Thomas, and Kennedy are all Catholic) on the Supreme Court sided with Hobby Lobby in a case that sought to establish whether certain corporations could be said to hold "religious beliefs" and whether being compelled to providing an insurance plan that furnished contraception to female employees who needed it would constitute a violation of those corporate beliefs. But the decision was much bigger than just Hobby Lobby and Conestoga Wood Products. Here are the 82 other companies that believe — contrary to scientific evidence — that certain forms of birth control are the same as abortion and that abortion is the same as murder. The Daily Beast's Abby Haglage did some impressive legwork in assembling this list of 82 other companies — some for profit, others nonprofit — that have mounted challenges to Obamacare's so-called "contraception mandate" and that now stand to apply to be exempt from providing certain non-abortion reproductive health care options to their female employees. Because God has apparently Taken A Stand when it comes to IUDs, and he only told dudes and the Pope about it, since IUD's weren't invented until the Bible was more than 2,000 years old. While many of the companies listed below aren't household names, some — like Eden Foods and the University of Notre Dame — are massive entities that employ thousands and make millions. Others, like Wheaton College in Illinois, suffered the embarrassment of suing the federal government over Obamacare's birth control mandate, apparently unaware that their health plan already covered contraception (they've since corrected the oversight). And who knows how many other closely held corporations are on the cusp of their own sudden and fervent religious conversion? Who knows how many women will be affected? And who knows how many of those women will, like Hobby Lobby's cashier-heavy workforce, make barely over minimum wage as it is? As Justice Ruth Bader Ginsburg noted in her mic drop of a dissent yesterday, Mars Candy, a company that employs 70,000 people, counts as a "closely held" corporation by the definition laid out by the 5 Catholic Dudes who agree that corporations are more people-y than women. TPM's Sahil Kapur points out that "corporate people" capable of holding religious beliefs employ "millions" of Americans. These 82 companies and nonprofits are just the tip of the iceberg. Catholic Charities of the Archdiocese of Philadelphia, et al. Encompass Develop, Design & Construct, LLC. Sioux Chief MFG. Co, Inc.